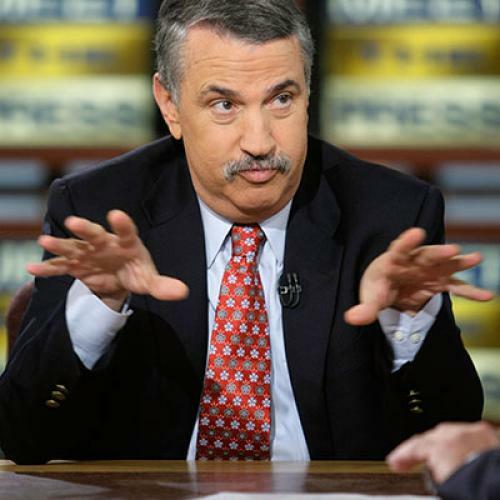 I may be a card-carrying member of the liberal blogging guild, but I'm not a Tom Friedman hater. Seriously, I respect his body of work, going back to his days when he was reporting from Lebanon for the New York Times. I appreciate the breadth of his knowledge, which surely exceeds mine. And I admire his ability to produce columns for as long as he has been doing it. Opinion writing isn’t as easy as it looks. But Wednesday’s column was one of those that drove even me bonkers. And it’s not because the column as a whole was awful. It actually wove together some disparate ideas into an interesting thesis. The problem was the last paragraph, which repeated one of the most annoying and pernicious tropes in American politics today. The column took readers around the globe, pointing out how leaders in Europe, the Arab Mideast, China, and the U.S. had each squandered opportunities to strengthen their countries. The Europeans didn’t take advantage of low interest rates to invest in their productivity. The Arabs didn’t take advantage of relative stability to democratize. The Chinese didn’t take advantage of growth to crack down on corruption or undertake political reform. The Americans didn’t take advantage of budget surpluses and a Cold War dividend to restore fiscal balance. What’s wrong with advising Obama to promote a balanced approach of stimulus and Simpson-Bowles style deficit reduction? Nothing at all, except that he’s already doing something like it. Obama’s employment proposal, the American Jobs Act, calls for a burst of new spending on public works, aid to the states, and targeted tax breaks—precisely the kind of measures that, according to the majority of mainstream economists, would boost growth while bolstering the country’s infrastructure. Obama’s latest budget proposal calls for higher taxes on the wealthy and a variety of cuts to federal spending. According to Bob Greenstein of the Center on Budget and Policy Priorities, that proposal make “significant progress in reducing deficits”—enough to stabilize deficits at less than 3 percent of gross domestic product within a decade. You can legitimately criticize either proposal. The deficit reduction proposal isn't enough to address the government’s long-term fiscal imbalance; Simpson-Bowles would, in fact, do more. But a major reason Simpson-Bowles would cut more is that it would raise more revenue. And the primary obstacle to raising more revenue right now isn’t Obama and the Democrats. It’s the Republicans. They won’t discuss deficit reduction if it includes serious increases in new revenue. They also have no interest short-term deficit spending, whether it’s to boost the economy or invest in long-term productivity. Basically, Obama has taken up the approach Friedman recommends, the Republicans have made clear they want nothing to do with it, so Friedman has decided the party that needs to change its behavior is ... Obama. We’re going to responsibly reduce this deficit. You know -- two Presidents over the last 30 years that have actually reduced the pace of the growth in government spending happen to be on this stage right here. They happen to be the two Democrats. So we have to get our deficit and debt under control. We’ve got to do it in a responsible way, cut out programs we don't need. I’ve already signed a trillion dollars in cuts that have already been made, another trillion that are slated to be made. But we’re also going to ask folks who can afford it like the two of us to pay a little bit more -- and some of you, too, so don't chuckle -- (laughter and applause) -- to pay a little bit more so that we can afford the things that will help us grow. That's the right recipe. That's what made us an economic superpower. And that's the policy that we’re going to pursue. I sent Congress a jobs bill last September full of the kinds of bipartisan ideas that would have put our fellow Americans back to work and helped reinforce our economy against those outside shocks. I sent them a plan that would have reduced the deficit by $4 trillion in a way that’s balanced – that pays for the job-creating investments we need by cutting unnecessary spending and asking the wealthiest Americans to pay a little more in taxes. You can go through the White House website and find literally dozens of excerpts like these. The problem is that nobody seems to have noticed them—a problem that, you might think, a prominent New York Times columnist could help fix.